Mark Zuckerberg: There is a difference between being obsessive and being motivated. With over 500 million members worldwide, Facebook has come a long way since it was just a little social networking site kicking around a few prestigious colleges in the United States. In fact, I remember quite vividly when I first heard about it. It came out of nowhere and suddenly everyone I knew was asking why I wasn’t on Facebook yet. I actually held out. I had done Friendster and Myspace. Why did I need this new network to come into my life so I could feign the idea of closeness with people I had neither seen nor thought of for years? For days, I cursed it to anyone who would listen. This made it particularly difficult when I actually joined Facebook a few weeks later and started inviting all the people I had complained about it to, to be my friend. THE SOCIAL NETWORK, or what is affectionately known as “The Facebook Movie”, is not about a bunch of bored office workers or late night loners wasting hours of their lives on Facebook. That’s about all it isn’t about though. Screenwriter, Aaron Sorkin, has taken the real life story of how Facebook came into existence and turned it into something so much more revealing about human nature. By walking us through the two lawsuits that Facebook co-creator, Mark Zuckerberg (Jesse Eisenberg), was served as a result of how he went about co-creating Facebook, Sorkin is able to comment on everything Facebook touches on, directly or indirectly. Suddenly, a factual account of a civil law suit is able to expose America’s class system as still going strong, our universal fascination with gossip and popularity and the increasingly blurred difference between public and private statement. Even the inclusion of the lawsuits themselves denounce an American fascination with suing to get even, even when that means suing your best friend. Fortunately for Sorkin’s ambitious script, David Fincher helms THE SOCIAL NETWORK and I really want to add him as my friend again after THE CURIOUS CASE OF BENJAMIN BUTTON made me hide him from my news feed. (Kidding, David Fincher is not my friend in any capacity). Fincher has this one though. He has an incredible awareness of the implications being made by the actions and accents the perfect moments to prove the points subtly and effectively. He also drives brave, brazen performances from his three young stars. Justin Timberlake shows unexpected dramatic depth as Sean Parker, the creator of Napster. 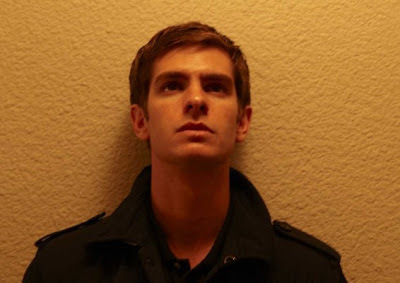 Andrew Garfield finally shows me why I should give him any notice as Facebook co-creator, Eduardo Saverin. And Eisenberg, an actor that is oft criticized for being one note, takes what is now his signature whip of a tongue and infuses it with a strong sense of character and understanding. He plays Zuckerberg as an unstoppable force, driven by a deep-rooted self-hatred. You want to hate the guy yourself but Eisenberg makes it so you think twice before you do. One of my original arguments for not joining Facebook was that I thought it enforced a horrible falsehood. People could remain close virtually and keep up with loved ones without making any actual effort to be a real part of their lives. It would drive us further apart while making us feel like we were getting closer. 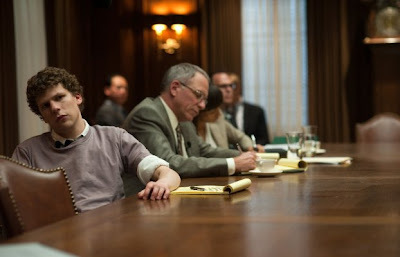 THE SOCIAL NETWORK proves me wrong though. This fantastic and fascinating piece of filmmaking will unite us all through the one thing all 500 million of us can relate to, our love/hate relationships with Facebook. And by breaking it all down, Fincher manages to find the heart behind the screen. 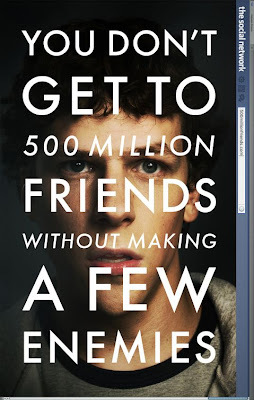 How many sheep would you give The Social Network? I adored this movie! What I thought was going to be a weak “historical drama” turned out to be a brilliant look at this invention that changed the internet. I loved that it seemed Sorkin and Fincher weren’t saying, “This is the story of Facebook,” they were saying “This is the story that people will tell about Facebook until it becomes a myth.” I thought it mad a brilliant simile between the internet and religion. I can’t say it enough. I really, really loved it! It really is about everything! The religious angle was not one I really saw when I watched but I’m going back tonight most likely – this time without a pad and pencil – so I will look for it. I just loved how Sorkin and Fincher took this matter of fact approach to the general plot that allowed for a sea of subtext to spill over from it. Tonight, I just want to let it rush over me. I even bought the score already! Some people have said the film paints Zuckerberg in a decidedly nasty light but I disagree. I truly feel like you get to see the pain inside the man that inspired some of his best and worst decisions … fictionally speaking, of course.